Challenge students to generate 100 different ways to represent the number 100. Students will easily generate 99 + 1 and 50 + 50, but encourage them to think out of the box. Challenge them to include examples from all of the NCTM Standards strands: number sense, numerical operations, geometry, measurement, algebra, patterns, data analysis, probability, discrete math, Create a class list to record the best entries. Some teachers write 100 in big bubble numeral style and then record the entries inside the numerals. If your school has the machine that enlarges 8.5x11 size papers to poster size, use this option to create the class chart for recording. Even better, laminate (cool lamination only) the enlarged chart for use each year. Download the 100th Day Challenge for student use in recording different ways to represent the number 100. Students create an ongoing memory chart they can celebrate on the 100th day and they always have a ready answer to "What did you do in school today?" Consider adding this practice to your calendar routines. Students who add a straw to the school day count each day will celebrate by creating their first (and only) hundred bundle on this day. This is a huge step in student understanding of our base-ten system, so be sure to allow lots of time for this changeover. Remember to have students physically count the straws before bundling them. It is well worth the time and expense to have small groups of students each bundle 100 straws into groups of ten and then into a group of 100. 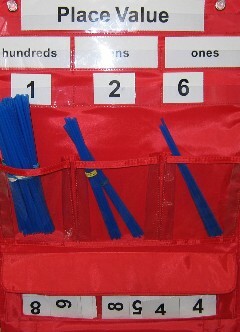 Be sure to ask students what changes in the written number when they create a bundle of ten straws (or 100 straws) and place the bundle in the tens (or hundreds) place. Repeated exposure to this process helps students build a meaningful appreciation of our base-ten system and place value. Bundle Song: Consider adding this song to your school day count routine. Sung to the tune of the Dreidel song, it has versions for both bundles of 10 and bundles of 100. Download The Bundle Song to use on all bundle days (making a 10 and making a 100). This program presents the 100 board with missing numbers. Students click on the carrot and the program counts, saying and highlighting the numbers until it comes to a missing number. The student must enter the correct number which the computer then reads and continues counting until it reaches the next missing number. Play Count Along to 100 game online. Students must place the correct missing tiles in the hundred grid to complete this online game. Play Mend the Number Square Game online. 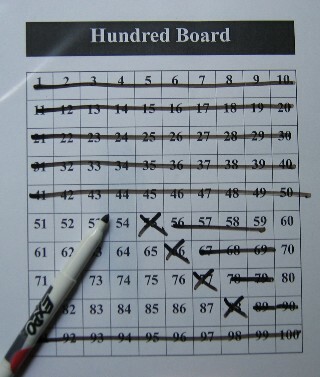 To celebrate the hundredth day, try this number activity. 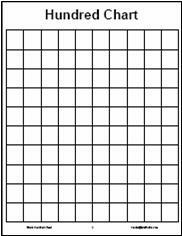 Provide a blank hundred chart and ask students to fill in the top row, #1-10. 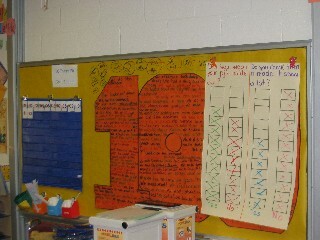 You might also ask students to fill in the 10 column. Then, ask students to fill in different nonsequential numbers so that they must use the patterns in the hundred board to write the numbers in the correct row and column. After several dictated numbers, ask students to fill in a row or a column, or all the counting by 5 numbers, etc. 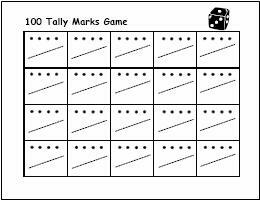 Observe students as they complete this activity and you will learn a lot about the strategies they are able to use, based on their flexibility with the hundred board patterns. Plan to repeat the activity, as needed, to help these students identify and use the embedded patterns. 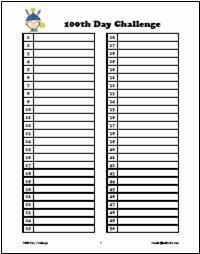 Download directions and student handout for the Blank Hundred Chart activity. 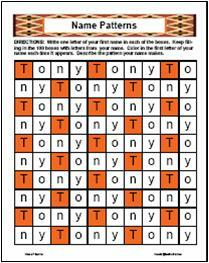 This activity uses a blank hundred grid to form name patterns. Students write one letter of their name in each box and continue the process until they fill all 100 boxes. They then color in the first letter of their name and examine the pattern formed. Collections of 100 Things: many classes ask students to bring in 100 of something for the hundredth day celebration. Consider adding some of these alternatives to this experience. 100 Museum: Assemble the "artifacts" with appropriate index cards that have a title and the exhibitor's name. Create the exhibit in a hallway or library so that students get to see 100 of many different things and begin to appreciate that the size of 100 is very relative to the size of the object. It can be very small or very big! Measurement (Linear): Predict how long a chain of 100 paper clips would be? Make a chain of 100 paper clips and use it to measure classroom objects. Additional challenge: If the whole class hooked their chains together, how far could you go from the classroom? Measurement (Time): How long would it take to write the numbers 1-100? Count from 1-100? Draw 100 ________? Do 100 jumping jacks? Blink your eyes 100 times? Create a class book of 100 counts and how long it took for each one. Make sure students make predictions before doing the experiment. Estimation Jar: Place different sized objects in the same size containers. Challenge students to decide if there are more or less than 100 in each container. Challenge students to solve these problems that involve the number 100. Hundred Board Logic Problems: Try some of these problems with students. Students must use clues to eliminate numbers from the hundred board until a single number is left as the answer. Guess the Number: these logic problems include clues about money, measurement, and multiples that students must successfully use to find the answer on the hundred chart. See Guess the Number for more information and to download the teacher reference packet. Challenge students to use money and measurement clues to write their own Guess the Number problems. After reading One Hundred Hungry Ants, ask students to draw and label arrays for all of the different ways 100 ants could march in full rows. Challenge students to write a multiplication number sentence to match each array. See additional activities for this book. Download 100 Shoes centipede math activity. Learn all about the new $100 bill design and see if you can find the errors in a counterfeit bill. See Nova's Anatomy of a Bill. Check out these sites for additional Hundredth Day Activities. The Hundredth Day of School Website was created by Joan Holub, illustrator of the book, The 100th Day of School, by Angela Medearis (Scholastic), to encourage and enhance 100th Day celebrations in schools. 100th Day of School includes books to read, schoolwide celebrations and teacher suggestions. Visit this site for Hundred Day of School poems and songs. 100th Day Books, Poems, Songs and Activities from Kindergarten Treehouse.